Slurp, slurp, slurp can be heard throughout Japan as people slurp on their ramen noodles. Ramen was made for slurping. It is believed that as you slurp the ramen noodles, you create a greater umami experience. In one of my poorer attempts at this, I wore my ramen broth down the front of my tailored shirt! Simply put and almost disregarding the recipe’s complex flavours, ramen is Japanese noodle soup. But leaving the description there is unflattering at best and insulting at worst. Ramen is a Japanese noodle soup consisting of Chinese-style wheat noodles (alkaline noodles) served in a meat or fish broth, flavoured with soy sauce or miso and served with sliced pork, dried seaweed and green onions. Nearly every region of Japan will have its own ramen variation. Ramen has become a staple food in Japanese culture and is more popular than sushi with many salary men queuing up for hours at the more popular ramen hotspots to get their bowl to slurp. Believed to have been brought back from China at the end of the second Sino-Japanese war, many soldiers, familiar with this Chinese cuisine, set up Chinese restaurants throughout Japan serving ramen. But like everything the Japanese do, they made it better. Eventually the instant ramen created by Momofuku Ando allowed anyone to make a simple ramen dish at home just by adding boiling water – indulge me if you will – Japanese pot noodle but better. 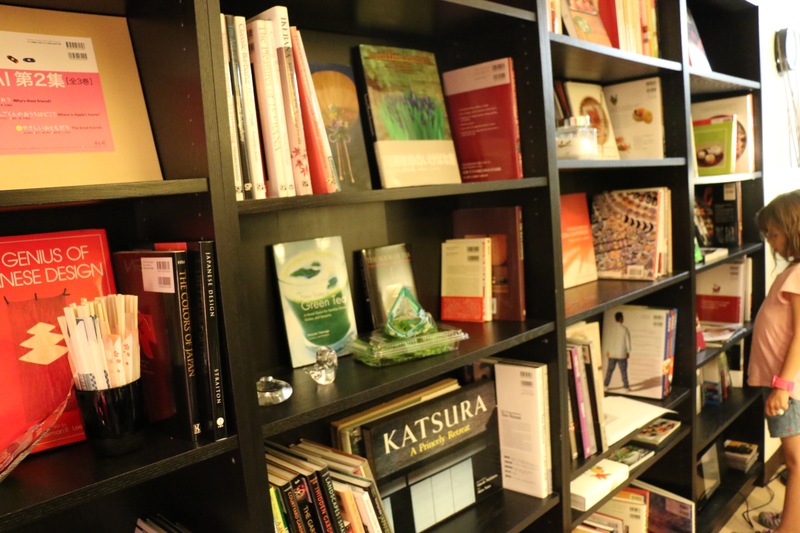 However, if you are aiming for authenticity in your kitchen you need to plan well in advance. If you want a bowl of ramen on Friday, you need to start with the recipe on Wednesday! TARE: 4) make the tare by roasting chicken backs for 20 minutes until mahogany brown, 5) deglazing the pan with sake, 6) adding mirin and soy sauce, 7) add pork belly/shoulder pieces to the liquid, 8) simmer gently for 1½ hrs, 9) strain the meat and bones out of the tare, 10) chill the liquid and remove the fat that rises to the top (Keep this fat to add to the ramen dish when serving). ASSEMBLING THE RAMEN DISH: 11) season the broth with tare and salt, 12) add bacon fat, 13) serve with whatever accompaniments you want. There are so many stages – each adding levels of depth to what inevitably becomes a complex flavoured dish screaming UMAMI at you from every direction. Even though the stages themselves are not complicated they are time consuming and no-one has the time or the inkling to carry this out in today’s busy routines. So I’ve come up with a cheat’s version of this dish cutting out the need to boil kelp for hours on end and roast chicken carcasses into the mahogany spectrum. 1st: Pour the chicken stock into a large saucepan and heat gently. 2nd: Add 3 spring onions cut in pieces from root to tip and add to the stock. 3rd: Cut the carrot into chucks and add to the stock. 4th: Reconstitute the dried shitake mushrooms in boiling water and add this to the stock with some of the mushroom flavoured water (mushroom dashi), simmer gently until the dish is ready to assemble. 5th: Season to taste with soy sauce, salt and pepper. Simmer for 20 mins. I used chestnut mushrooms as dried shitake mushrooms are sometimes hard to find. 6th: Put the pork belly into a 200˚C oven for 20-25mins until the pork is cooked through. 7th: Prepare the tare by heating olive oil and pouring it over the grated garlic. 8th: After the pork belly is cooked bring it out of the oven and allow to cool slightly. Pour the rendered fat into the chicken stock. 9th: Boil your ramen noodles following the instructions on the packet. 10th: Assemble and serve: Pile your ramen noodles into the centre of your ramen bowl and assemble the shitake mushrooms, bean sprouts, pork slices, sliced spring onions, and boiled egg around this. Pour ladles of your chicken broth into your noodles until you have a bowl filled with soup. Spoon some of the tare over the noodles. Serve with a nori rectangle. I know it is inauthentic but it’s a long way from pot noodle, ingredients are accessible, easily recreated and unapologetically absolutely delicious. Looking back through my photos and trying to piece together a food journey through Japan is easier said than done considering the extensive travelling we embarked upon taking us from one point of the country to the other. We left our westernmost point, Hiroshima, and made our way back to Tokyo via Osaka. Walking around Dotonbori, a very popular tourist area in Osaka, you quickly realise that this sentiment is not exaggerated. Tripadvisor’s #1 thing to do in Osaka is to visit Dotonbori! A plethora of restaurants, stalls and bars that line the streets of Dotonbori. I was clearly going to be a very happy man. 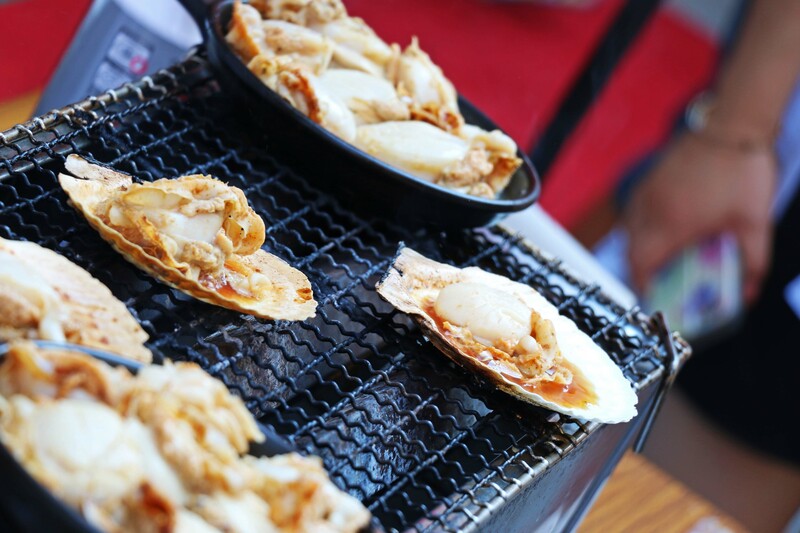 During the day, even under the intense summer sun, street vendors line the streets selling food items such as barbeque scallops, gyoza, roast chestnuts and the ubiquitous takoyaki (Octopus balls). Takoyaki – described as Octopus Balls; think of these are the savoury version of a cake pop. And can be found everywhere! Cooked in what appear to be cake-pop pans over gas burners. Whether at a restaurant or on the street, this is definitely worth a watch. These Takoyaki chefs half-fill the ‘cake-pop’ pans with a very liquidy batter. They then place an octopus piece into each and sprinkle with plenty of spring onions and red ginger, then pour over more batter. Once the batter begins to set they go at it with metal chopsticks and make sure each ball is cooked all the way through, perfectly spherical and evenly browned. Then all that’s left is for you to decide how many pieces you want – these are either smothered in Takoyaki sauce, drizzled with Japanese mayonnaise or sprinkled with nori pieces depending on the establishment. We went to a few different stalls trying different takoyaki in boxes of 6 – some people happily walking away with boxes of 24 balls! Scallops cooked over charcoal – Another absolute delight were the scallops cooked on a grill. The man who ran the stall, would cook the scallops in a small wrought iron frying pan and as people ordered he would place the shell on the grill and place the scallop on the shell with a knob of butter and blowtorch it until the butter was frothy. Sadly, he wouldn’t serve you the scallop in the shell but in a polystyrene tray. Admittedly, the shell would be so hot that there is no way you’d be able to hold it anyway! Shell or no shell – lip smackingly delicious! Gyoza – were also prevalent throughout Dotonbori. We stumbled upon a chef who was making 100’s of these and placing them into crates ready for the lunchtime trade. I can imagine he would have to undertake the same routine later on in the afternoon to have enough gyoza for the night time trade. Crescent shaped, pork filled, fried and steamed dumplings – Oishi! Gyoza are tasty and moreish – regardless of how full up you were from the takoyaki and scallop – there is always room for a gyoza… or three! The streets around Dotonbori, resonate with the multitudes of people getting to and from work, popping out during their lunch break to grab a quick bite to eat or even take a box of 24 takoyaki back to the office. However, at night time, Dotonbori takes on a whole new persona. With its attractions like the Glico running man at the ‘pick-up bridge’ and giant food signs, loud music and even more people; many rushing to dinner reservations – the vibe is electric! That evening we dined at Gyumabe M a specialist in Matsusaka Beef, IMO better than the very over-rated Kobe Beef! (Kobe is very near Osaka). In the centre of our table was a hot plate heated by gas burners underneath. The beef selection we chose was presented to us on a beautiful platter and the waiter identified a piece of fat that had been taken from one of the steaks. We were subsequently shown how to render the fat on the hotplate and use this to stop the beef from sticking, instead of using oil or butter. So tongs in hand, we went about cooking our beef to our liking – rare for me! Once we had finished our meal, the manager, chef and waiters, with props in hand, posed with us for a few photos… this was a super fun place to come. Great place, great food, great personalities! 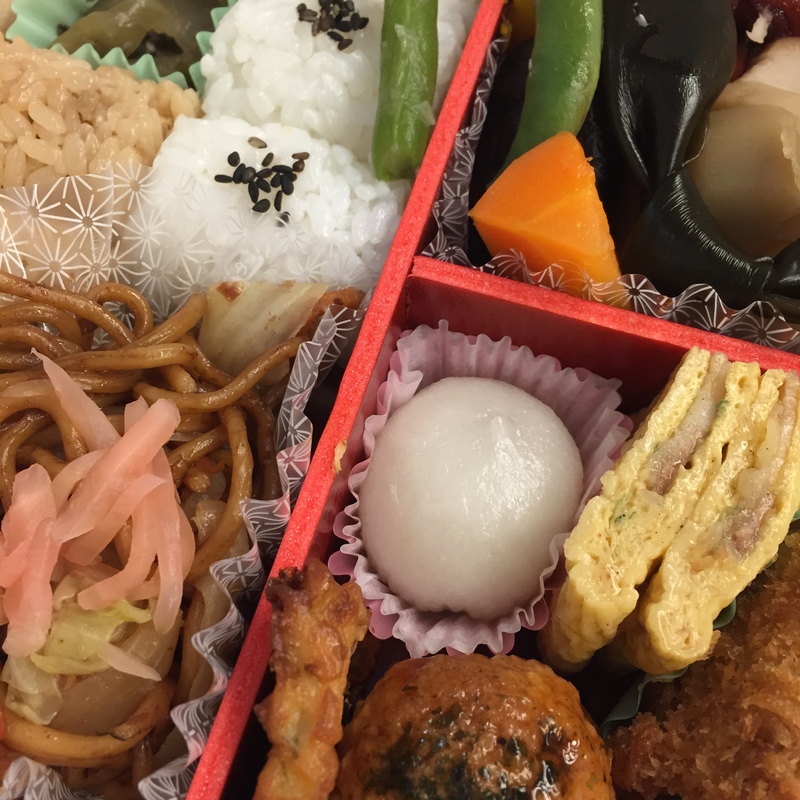 The following morning, we descended for breakfast and in the exuberance of Dotonbori I piled my plate high with Japanese and Western items for breakfast. Finishing with a corn dog! 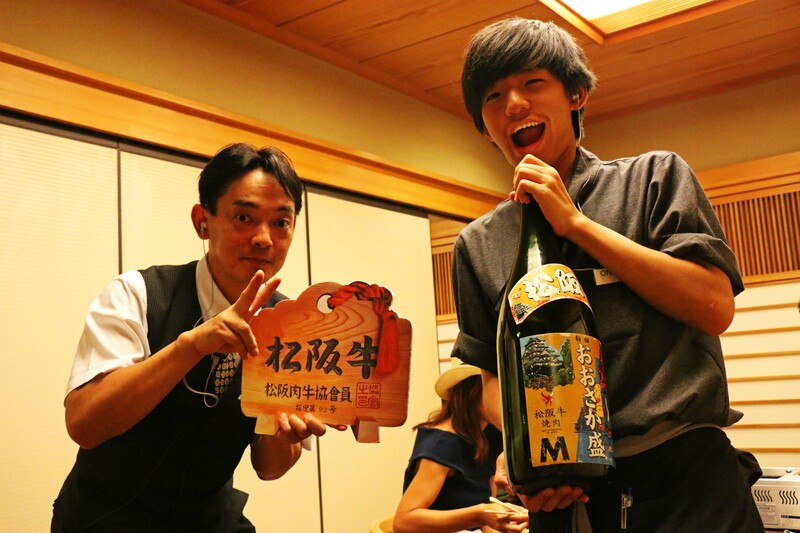 Having left the still mountains of Koyasan, we travelled to Hirosima – home of the Okonomiyaki. Okonomiyaki is a savoury pancake, “grilled as you like it” with a variety of ingredients; typically batter, cabbage, pork and optional items such as squid, prawns, octopus and sometimes cheese. In Hiroshima, these are layered rather than mixed and served over noodles with a fried egg ontop. Lashings of delicious okonomiyaki sauce smother the ingredients just before serving! As this was being put together I honestly thought that it would not be very nice, however, I was very pleasantly surprised. The flavours not only worked together but the okonomiyaki sauce tied it all together with its sweet-savoury (umami) flavour. I thoroughly enjoyed this experience – walking into a 3 story building with several Okonomiyaki Hiroshima-style restaurants on every floor. Seriously – only in Japan. The following day we ferried it over to the Island of Miyajima, where not only did we climb to the top of Mount Misen (and down again!) 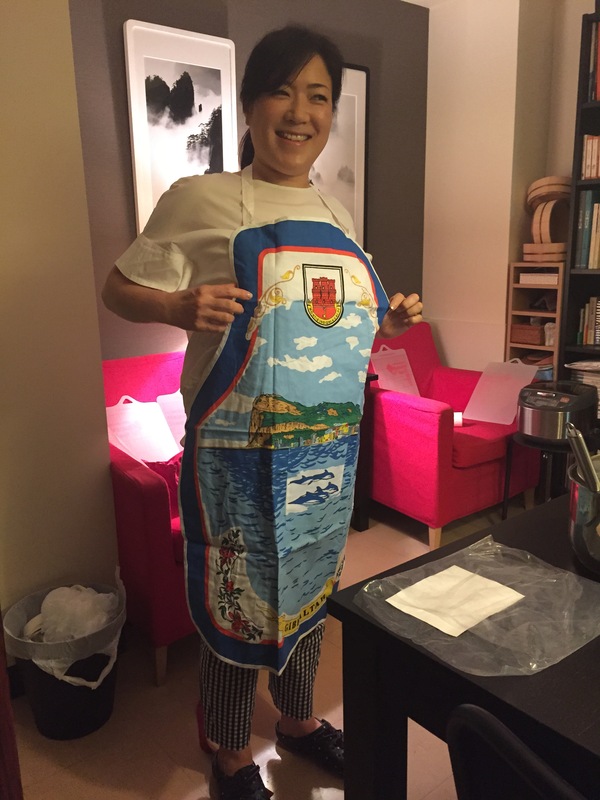 and get involved in traditional festivities and celebrate with locals in a Festival of Lanterns; I also had the pleasure of eating oysters caught fresh from the bay. The only difference with these oysters was that instead of being served fresh, these were deep fried and served over rice with an omelette on top! And as vulgar as this sounds and as huge an abomination to cook oysters generally would be, this dish was great to eat. Admittedly, anything deep fried is good! Who would have thought that cooked oysters would be good? The oysters were meaty and succulent and topped with the egg made for a filling, savoury, pit-stop in the middle of a very hectic day where refuelling with carbs was necessary to be able to continue on the fast paced journey that we were taking through Japan – all washed down with the ubiquitous miso soup. The gentleman who owned the shop, instructed his wife to serve us some green tea whilst we were trying one. I brought a box of these back to Gibraltar and were a hit with everyone I gave one to. Onto Osaka next – the stomach of Japan! KYOTO: Wondering the streets of Kyoto in the district of Gion, we stumbled upon a waitress/hostess on the street. She stopped us and asked if we had a reservation for her restaurant – as we were completely lost and having no reservations to eat anywhere else we asked if there was availability for us. She quickly went inside and found us two seats at the counter. Let’s be honest, anywhere that gives you the privilege of watching food being prepared, trusts its quality, integrity and high standard. I cannot speak highly enough of Tempura Endo Yasaka Kyoto Japan. Our hostess was charming and funny and saw to our needs perfectly, for example we ordered two beers, in limited English and gesticulating, she explained to us that we were better off ordering one at a time as they were large bottles. …The two tempura chefs, master and protégée, set to task, organising the different pieces that they would be using to create our tempura. Individually frying each piece. From batter to oil to plate to mouth. Each dish was exquisite – crispy, light tempura; served warm. The flavours well-balanced and nothing overpowered the rest of the menu. Actually, the further into the menu we went the bolder the flavours and the richer the pieces. My tastebuds were tantalised from the initial squid and bream sashimi all the way to the tomato sorbet I had for dessert. 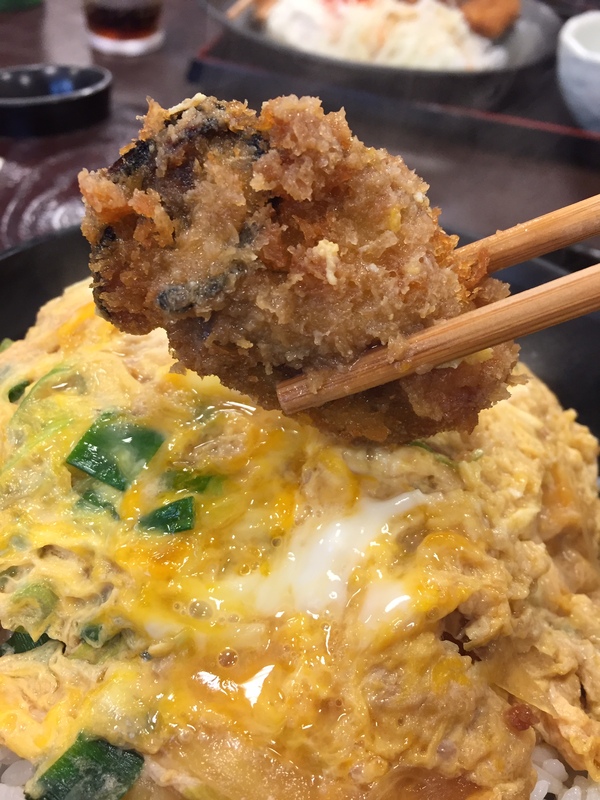 Items such as nori-rolled sea urchin tempura, cod tempura served over a soy and mirin sauce, prawn tempura – even their heads were covered in batter and deep fried! Yakimono – seasonal fish – like our beachside boquerones but delicate and artistically presented to emulate the fish swimming in the sea and the impressive cod served with bonito shavings. The most impressive part, other than that everything was delicious, was that the chefs timed our tempura perfectly so that we could eat our meal together. They timed 10 vegetable pieces to coincide with 15 seafood pieces as well as the other components of the set meals. As the chef served each piece he would come over and explain, in English, what each piece was and whether it would be best with salt, lemon, wasabi powder or dipped in the dressing. Clip courtesy of NINJA MONKEY on YOUTUBE. Remember to SUBSCRIBE! What an experience. After my tomato sorbet for dessert I left stuffed but wanting so much more! This restaurant is truly a 5* gourmet experience and a must for tempura lovers. Next time you’re in Gion-Kyoto, Japan – dinner has got to be here, it can be expensive at £85 approx pp but it is worth it. Just make sure to book as there a plenty of other tables, rooms and small group tempura stations inside that must be worth a visit. Another great dining experience in Gion-Kyoto was at Gion Karyo, a Kaiseki (Japanese cuisine) restaurant. Kaiseki is Japanese cuisine such as Yakitori, etc but known for its meticulous preparation and beautiful presentation. It felt like dining at a Michelin starred restaurant without the hefty price tag that can sometimes go with. Here we enjoyed some amazing dishes, such as: chicken sausages (tsukune) glazed in soy and mirin and dunked in raw egg yolk before serving, duck teriyaki, soy glazed pork; which were absolutely amazing and I would definitely try and recreate at home followed by an amazing homemade dessert – vanilla ice-cream, coated in a sugar glaze and given the crème brûlée treatment. However the surprise was cutting into the dessert as there was a sugared yolk sitting under the glazed carapace which oozed out of the vanilla ice cream – decadent, luxurious and delicious – OISHI!!! On another evening we ate at Kyoto’s Train Station. Yes, the train station. Kyoto’s train station is a huge experience full of shops, escalators that climb to heaven, sky walks and restaurants and here we tried the delicacy of the region a grilled ox tongue platter and lemon chicken pieces! The ox tongue was tasty and bold in flavour but very chewy – considering that the ox, continually grazing, must give its tongue a workout would explain why the meat was tough. The chicken pieces, marinated in lemon juice and then floured and fried – lovely. We visited Nara for a day and grabbed a quick Japanese curry lunch on the go whilst visiting deer, buddhas and temples. Then having spent three nights in Kyoto we ventured south to Mount Koya (Koyasan). MOUNT KOYA (KOYASAN): We checked into our temple lodgings to stay with Monks at Ekoin, Koyasan. Our hosts explained how the lodgings ran and told us that our meals would be vegan meals due to the monks’ Buddhist beliefs. That evening, before the night walk in honour of the dead, our room was prepared for dinner by trainee monks and after dinner prepared with our futons whilst we were out. In the morning whilst we went to morning meditation and the ceremony of fire, our futons were cleared away and were prepared for breakfast. On both occasions, meals consisted of miso soup, salad, pickled vegetables, boiled rice, tofu and seasonal fruit arranged in bowls. The food here was sufficient for our needs and well balanced. If however, you needed a larger portion or meat, there were plenty of places to have bought extra food in the village-town of Koyasan. “Sumimasen, kore wa American dog?” was the chant my travelling companion heralded as he saw cooked meat products at a butchers shop! 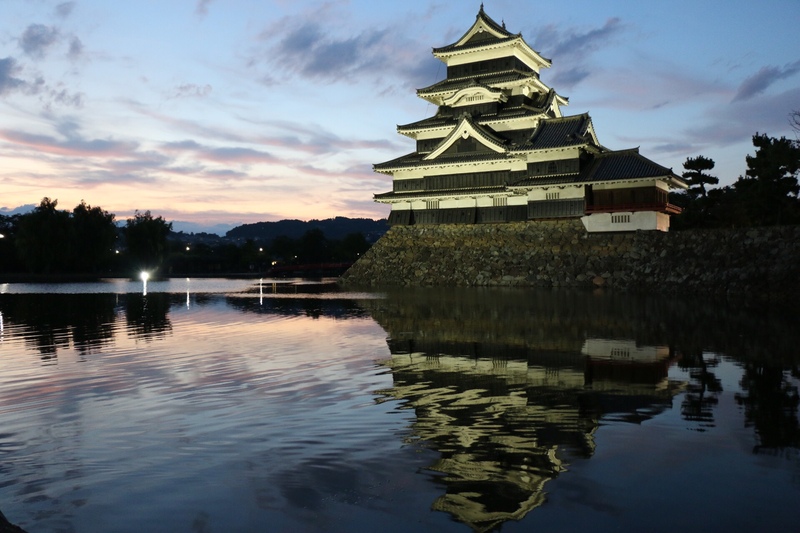 Having a long journey ahead of us we picked up something to eat at the train station and arrived in Matsumoto ready to wonder around and find Matsumoto Castle sitting atop a reflective lake. Before we knew it, evening had turned to dusk and dusk to twighlight and then darkness. We quickly looked around for a place for dinner and ended up asking a couple for directions. We showed them a photo of the entrance to the restaurant we wanted to go to; they discussed between themselves where they thought it was, and walked us to the restaurant! We chose a local, family-run restaurant where we ordered horsemeat sashimi – which I have to say was absolutely delicious, if we hadn’t known that it was horsemeat we would have been none the wiser, we probably we have enjoyed it as beef carpaccio! This was followed by a pork cutlet served over rice with once again the ubiquitous miso soup. The cutlet was juicy and tender and coated in an omelette loaded with spring onions – very tasty. Hida Beef was on the menu in Takayama. The first of my two Hida beef experiences was as a Hida beef sizzler. Beef served in strips on a scorching hot sizzler, the waiter instructing us to turn the slices over until we were happy with how they were cooked. This restaurant had a diner kind of feel, with pictures of food and their prices on the walls and blueish fluorescent lighting, however, the beef was delicious. The second experience was more innovative. We walked to Trip Advisor’s #1 Restaurant in Takayama – if you’re not careful, you miss it! A shop-front full of chintzy relics from the past in total disarray greets you, however walk through the shop, pushing an old gate open at the back of the shop, to find – Center4Hamburgers; also covered in chintzy relics from the past. Fully booked for lunchtime we booked a table for that evening. And yes, I thought to myself, I should be eating sushi and sashimi NOT hamburgers in Japan. But Hida beef being a delicacy of the region and trying to experience different foods we had previously agreed to try and give everything a go. The burgers were amazing, the Hida beef cooked pink with a savoury seasoning coating the crispy, sweet meat and covered in melted cheese; served with spicy mayo on crisp lettuce in a toasted sesame bun. Each bite a feast for the mouth. Miso soup, cooked salmon, coddled egg, pickles, dumplings in syrup, yoghurt and seasonal fruits, all arranged in little bowls. On either side of the tray stood a burner with, spicy tofu soup on the left burner and slices of Hida beef with miso paste on the right for me to cook to my liking. Served with as much rice as I wanted; all to be washed down with jasmine tea. For those that ordered a Western Style breakfast there was a burner on the go ready for diners to fry their eggs or to make an omelette, a salad, yoghurt and seasonal fruits. 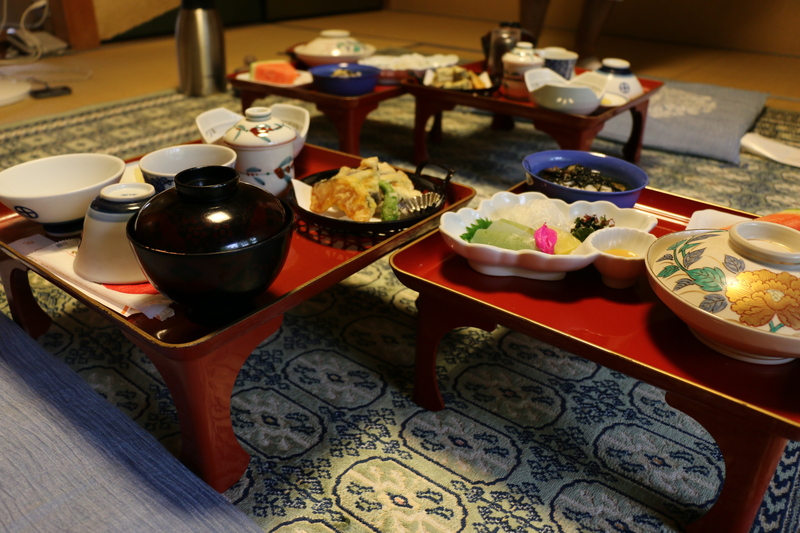 I thoroughly enjoyed this experience – dressed in my Yukata, sat cross legged at the table, sampling all the delicious components that made my extremely, healthy and well-balanced breakfast. A great way to start another hectic day of sight seeing and travelling. My only advice if having a Japanese breakfast is that you cannot be in a rush. There are so many parts of the breakfast to get through you need time to enjoy them all! We arrived in Ikebukuro, Tokyo, Japan around 7:30am. Jet-lagged, disorientated and in desperate need of coffee, we waltzed into the nearest STARBUCKS from our Hotel. Immediately, I thought, I can’t believe I’ve come all the way to Japan for a STARBUCKS! But that wasn’t necessarily the way the rest of the trip was going to (Ja)pan out! Once we got our bearings around the area we decided to head into air conditioned paradise (any shopping mall; be it over or under ground) just to get out of the scorching heat and stumbled upon a lunchtime spot that seemed to be ending its lunch service but were quite happy to take us in. With my limited Japanese and pointing at pictures in a menu, I ordered a set meal with a bowl of ramen – a Japanese noodle soup dish which was flavoured with ox tongue – and spicy chicken pieces served over rice and the ubiquitous miso soup. All dishes are accompanied by miso soup – a traditional Japanese clear broth made of stock called “dashi” into which softened miso paste (fermented soya bean paste) is mixed, tofu is often present in white blocks floating in the soup. Miso soup is quite savoury, so I can only imagine it being fundamental in helping people replenish fluids and salts lost through sweat! In the evening, we walked around the area of Ikebukuro and were somewhat intimidated by going into small, local establishments with only 5 seats available at a counter, full of locals and or people leaving work, as we almost couldn’t communicate with the proprietor without picture menus! However, using Trip Advisor, we eventually found a conveyor belt sushi place that came very highly recommended. The chefs and head chef in the centre of the track creating the sashimi/sushi, often to order, treated every dish as if it were the best dish they would be creating that evening. Precision and skill evident in every piece. The fish was delectable and easily washed down with green tea, poured directly at every seated station. 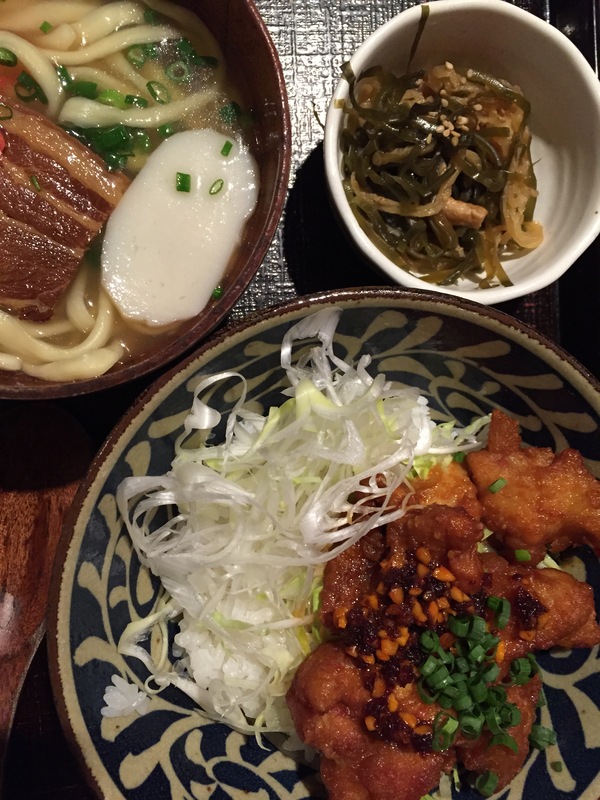 Great fun – delicious food; Oishi! The following morning we headed to an area of Tokyo called Roppongi and once again dived into the nearest STARBUCKS for a dark chocolate-mocha frap which is the only way to battle the morning heat! And after much tall building climbing, temple hunting and shrine locating we had worked up a bit of an appetite. This time we settled for steamed dumplings, gyoza, and spring rolls (vegetable and prawn). 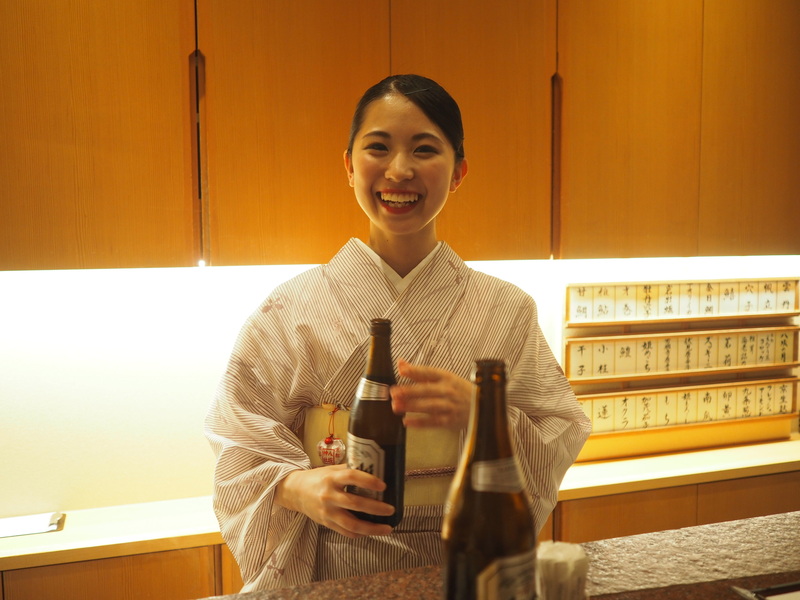 That evening we took a trip to Ginza – the 5th Avenue of Tokyo – and in a local basement bar sampled Yakitori. Japanese chicken pinchitos! 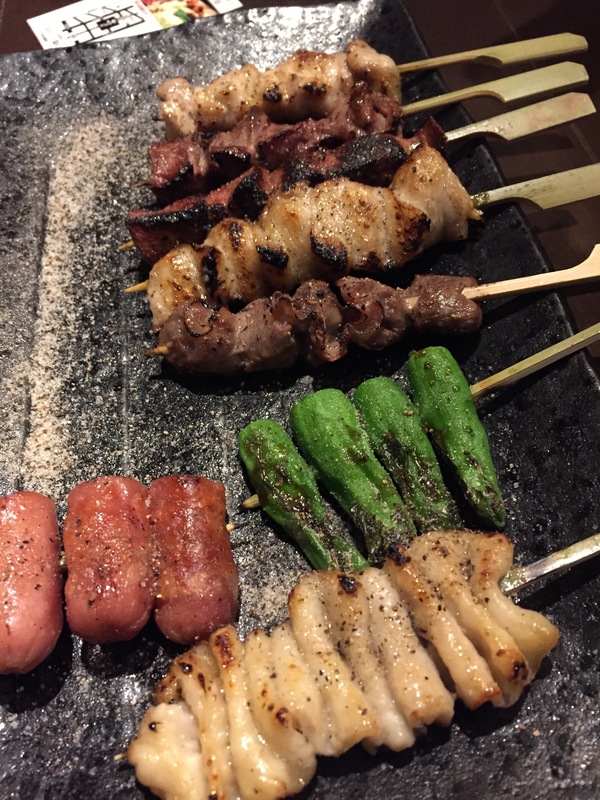 Yaki – grilled; tori – bird in the context of food, therefore, put it together = Yakitori is technically grilled chicken skewers but in Japan it’s not just thigh meat that gets a turn on the bbq. Chicken liver, heart, gizzards and chicken skin are also given the bamboo stick skewer treatment. So we ordered some fried calamari which were succulent and delicious and a plate of these varied 5 ‘meat’ yakitori. I quite like offal depending on the way the product is cooked – the yakitori were bold and gutsy in flavour; salty with a charcoal edge – very tasty, however, I couldn’t bring myself to eat the chicken skin which was pallid and uncooked! Tsukiji Fish Market, Tokyo is the world’s largest fish market and is a prime tourist sight – especially for jet-lagged tourists. It opens at 5am but if you want to be allowed into the world renowned Tuna Auction you have to get there at 4am to try and get a place. Being there early does not guarantee you a visitor’s pass! But wondering around the market at 9am when the stall owners are beginning to clear up is worth a viewing. The various fish, molluscs and crustaceans that are caught and sold wholesale are an impressive sight. After this and a river cruise to Asakusa for more temple spotting in the heat, we stopped for a very necessary cup of shaved ice. Imagine slush puppies that hold their shape as a mountain of ice flakes and squirted with whatever flavour syrup you want: from fruit flavours to matcha green tea flavour. I enjoyed my watermelon flavour as a reminder of summer back home. However, on the return to the hotel and needing a pick-me-up we stopped at cafe Italian Tomato, for an iced coffee and a huge slice of lemon meringue pie! Buzzing with sugar and caffeine we were ready for the evening in Harajuku. Warning: the Japanese slurp their food as a way to create ‘umami’ the 5th flavour (sweet, salty, sour, bitter and umami) plus slurping cools the noodles down. So if eating a bowl of ramen, slurping away to your heart’s content, your shirt will exhibit the effects! As happened that evening over dinner! We left Tokyo the following morning and headed to Matsumoto via Nagano; home of the Soba Noodle. Not only did we get to try amazing cold soba noodles with tsuyu (a dipping sauce made with dashi, sweet soy and mirin) but we were fortunate enough to see a Soba Master rolling buckwheat dough out to make these thin soba noodles. In summer, soba noodles are usually served cold on a bamboo tray called a zaru with seasonal toppings – we ate ours with vegetable tempura. I particularly liked this meal; the noodles were light and did not sit heavily on the stomach as pasta can sometimes. The tempura, crispy and incredibly light. With full bellies we packed our bags and headed to the station for the next stage in our journey. Join me.